Harvey and Terri Edwards were honored with the 2015 Chaloner Memorial Trophy. It was presented by David McNamee and Vesma Grinfelds at the Awards Dinner for the Greater Reno Stamp and Cover Show on July 25. This is the highest award presented by the Council of Northern California Philatelic Societies to someone who has demonstrated sustained service in the Council area. 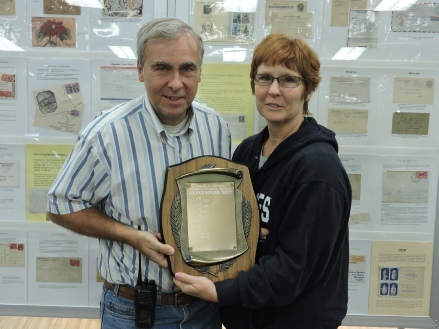 Harvey and Terri were recognized for their dedication and hard work in promoting the Greater Reno Stamp and Cover Show for the past 15 years. Harvey serves as the Chair of the Show Committee and Terri solicits and coordinates the show stamp exhibits. Harvey was recently elected to his third term as a Board Director and Terri has served as President and Treasurer of the Nevada Stamp Study Society.